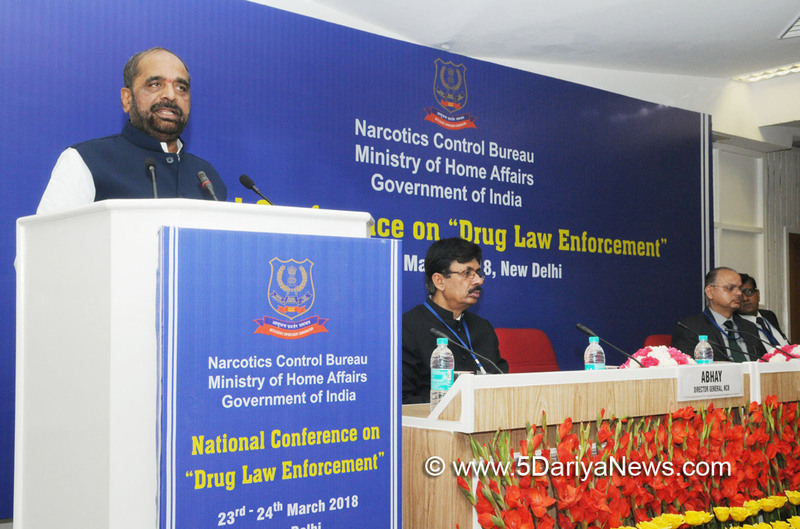 The Minister of State for Home Affairs, Shri Hansraj Gangaram Ahir today said that Narco-terrorism and its funding is a serious problem for the world, especially for India. Inaugurating the two-day first National Conference on Drug Law Enforcement here, he said the challenge for law enforcement agencies and the society is to prevent drug abuse among youth. The minister said, the problem of drug trafficking assumes importance for India as it lies in the “Golden Crescent” and “Golden Triangle” as a transit route for drug mafia. He said that India’s nodal drug law enforcement agency, the Narcotics Control Bureau (NCB) has been sharing intelligence information with other agencies of the world in tackling drug trafficking.Shri Ahir said that new challenges emerge in the form of Pharmaceutical drugs, precursors and synthetic drugs and the law enforcement agencies need to adopt new methods and technologies to curb this menace. The minister said the agencies must also take strong legal measures as the conviction rate in narcotics-related cases is very low. The Minister said that Ministry of Social Justice and Empowerment gives 90 percent financial aid to NGOs and other social organizations for creating awareness among youth against drug abuse and for rehabilitation of drug victims and training centres.The conference is being organised by the Narcotics Control Bureau (NCB), Ministry of Home Affairs. The Union Home Minister Shri Rajnath Singh will be the Chief Guest at the closing session tomorrow.More than 50 State and Central law enforcement agencies involved in combating drug trafficking are participating in this Conference. They include State Police organizations, State Excise departments, Border Guarding Forces, Central Armed Police Forces (CAPF), Directorate of Revenue Intelligence (DRI), Central Bureau of Narcotics (CBN), CBI and other Central agencies involved in drug enforcement work. More than 110 delegates are attending this Conference.Conference working sessions are focused on various topics such as ‘Wider context of drug trafficking in India’, ‘Financial Investigations’ and ‘Foreign & Cyber Investigations’. During these sessions various agencies would give presentations while UN and other foreign law enforcement agencies would share their experiences.